Hi Aspirants, here is the Current Affairs Quiz for 19 September 2016 useful for all competitive exams like SSC CGL, SSC CHSL, IBPS Exams, SBI Exams etc. 1. Who was on 19 September 2016 appointed as the chairman of Union Public Service Commission (UPSC) as per Article 316 of Constitution? Note: She will replace Deepak Gupta who demits office on 20th September 2016. She will be in office till completion of her term as member on January 3, 2017. 2. West Bengal government recently decided to confer this year's 'Bangabibhushan' to which singer? Note: Banga Bibhushan is a title instituted by the West Bengal Government to honour the services of personalities in various fields. 3. China and ____ have recently carried out joint naval exercises dubbed as Joint Sea-2016 in the resource-rich South China Sea (SCS)? 4. Eminent Malayalam critic and academician ____ was on 17 September 2016 chosen for the prestigious N Mohanan Suvarna Mudra Award 2016? Note: The award was instituted in memory of well-known short story writer N Mohanan. 5. Which Sports personality was recently appointed as the Brand Ambassador of Punjab National Bank? 6. Name the Young Indian shooter who recently (Sept-2016) won the gold medal at the ISSF Junior World Cup? Note: Event was held at Gabala, Azerbaijan. 7. 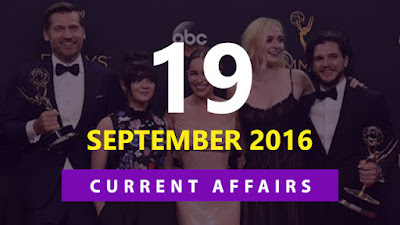 _____ won the best drama series at the 2016 Primetime Emmy Awards? 8. India’s Priyesha Deshmukh (23) has recently won a historic bronze medal in the first World Deaf Shooting Championships held at? 9. Who was recently (Sept-2016) appointed as chairman of state-owned Life Insurance Corporation of India? 10. Charkhi Dadri was recently added as the 22nd district of which state?